The lovely or (hot and scorchy for few) warm weather brings us the opportunity to style and let our feet free with open sandals. Buying brand new sandals for every season might seem very tempting but it also turns out to be a very pricey option. And as you know we are never going to ask you to compromise on style because of money. 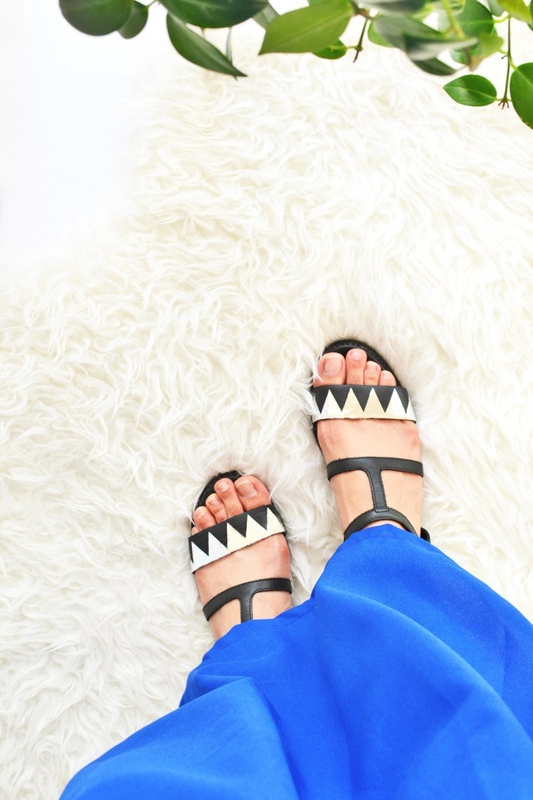 So, today, we at DesignTrends are going to help you style your old sandals in the easiest and most unique ways. We have compiled a list of 10 DIYs for you to experiment and take inspiration from. Trust us, the results will be worth all the time and effort. We see so many footwear in the market that are decorated with Rhinestones, these footwears indeed look good but unfortunately cost a lot. You can easily replicate the high-priced look with the old sandals that you already have in your collection. Rhinestones are easily available in a variety of color and shapes, just buy the ones you like and stick them to the desired pattern and voila! 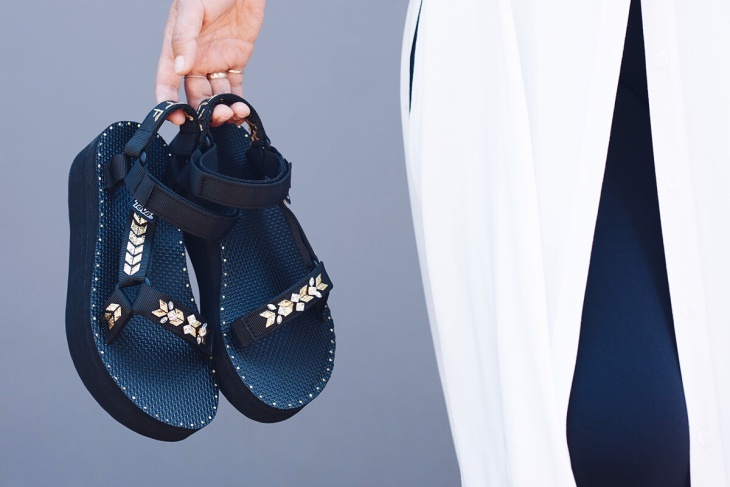 you have a brand new sandal already in under 15 mins. You can even place the Rhinestone in gold rectangular or pear settings for a more defined look. 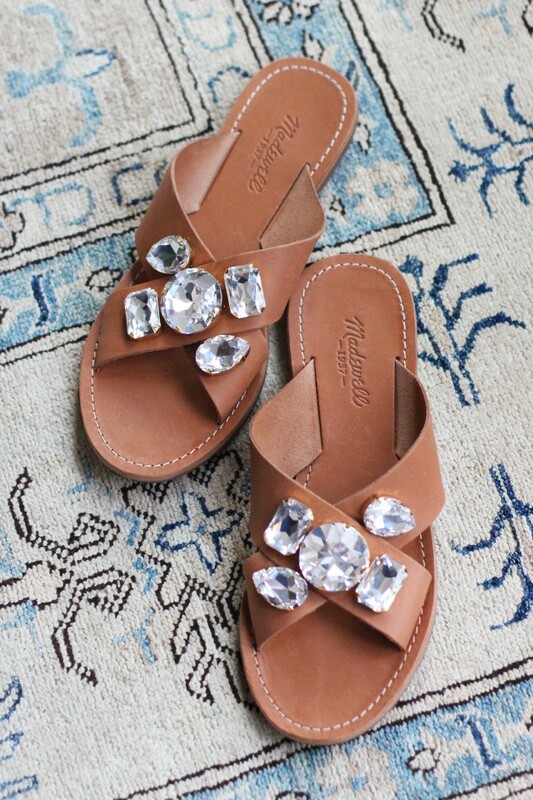 If you have a strappy pair of sandals, you can either cover both the straps or just stick to decorating one strap with Rhinestones. You don’t necessarily have to go for white stones, be as colorful and creative as possible. If you wish you can also glitter the base for a more dramatic look. If you have thin bracelets lying around in your house with no use at all, then utilizing them for revamping your footwear can be a good option. 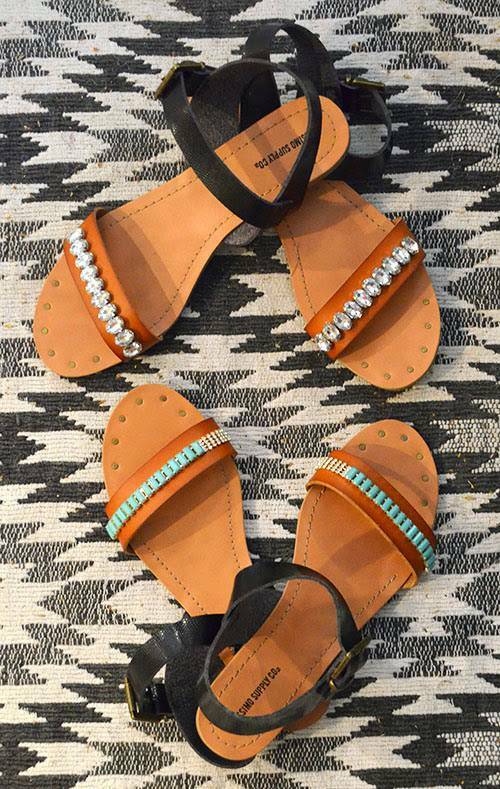 If you don’t like the jeweled look, you can also style your old sandal with thread based bracelets. This fun and easy DIY can transform the look of your old footwear completely. One of the most glamorous footwear DIYs to try would definitely be these snake strap sandals. 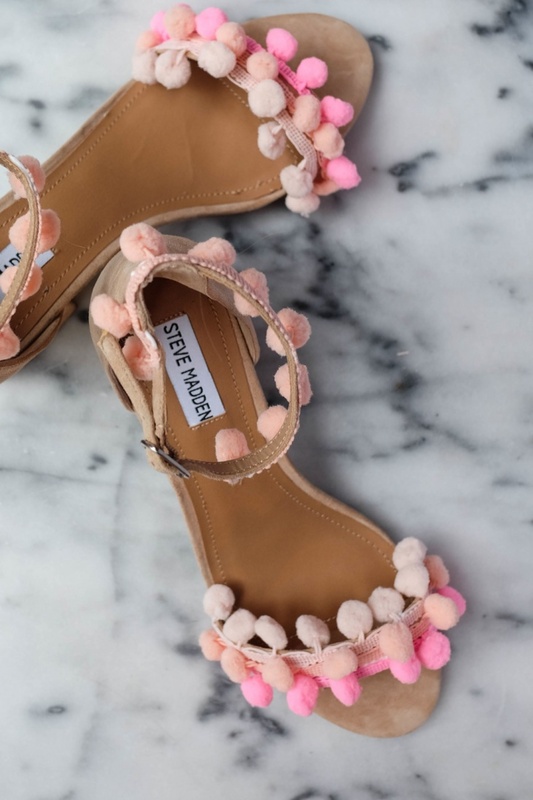 For this DIY you require an either a flat or heeled ankle strap sandals and two rubber snakes, that you can easily find at the local toy store. Spray paint the rubber snakes in the color of your sandals and either tie the edges with thread or glue the edge to the straps. You would not be able to believe the transformation. You can also use glitter, gems or crystals for a more glamorized look. 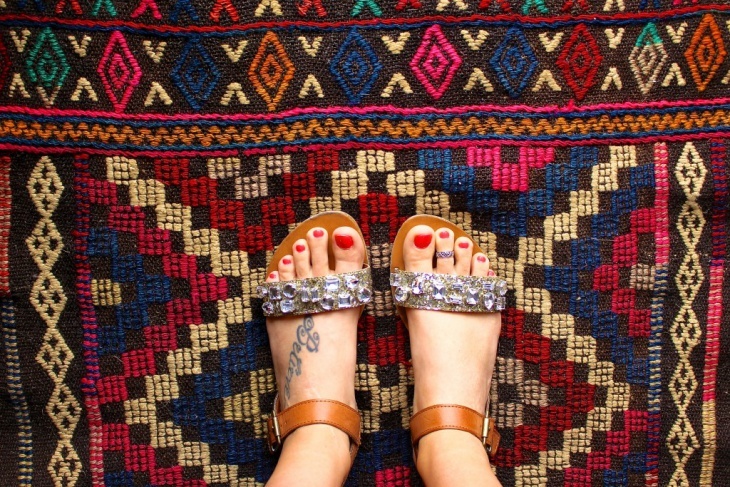 You can transform the look of your solid tevas by simply adding hot fix metallic and crystal transfers. You can choose the shapes of the crystals as per your own preference. All you need for this lovely metallic look inspired sandals is silver contact paper, leather sandals, and cutter. Trace the contact paper on the heels and cut off the edges. For styling, the straps cut triangles in the contact paper and stick it to the straps. Once you are done, carefully apply it to the straps, and you are good to go. The look would work well with any type of buckle sandals. All you need is 4 to 6 tassels and a thread to attach them to the strap in front and to the buckle at back. You can even stick slight glue to the base if you don’t like the tassels jumping and changing places while walking. For achieving this eye catchy Greek sandal look. All you need is silk tassels in 2 sets of assorted colors, waxed linen thread, Chaco liner pen, and scissors. The Chaco liner makes it easy to see the marks for placing the tassels. The waxed linen thread tightly secures the tassels to the lace strings. For achieving this urban bohemian look, all you would need is yarn bracelets, scissors, and hot glue gun. Cut off the bracelet to the desired shape and length and glue it to the strappy sandals, in need of a makeover. The look works best with simple black strap sandals that have a strap across the front or top. Pompom fever can be seen everywhere nowadays, from clothes to bags to footwear and many other accessories. 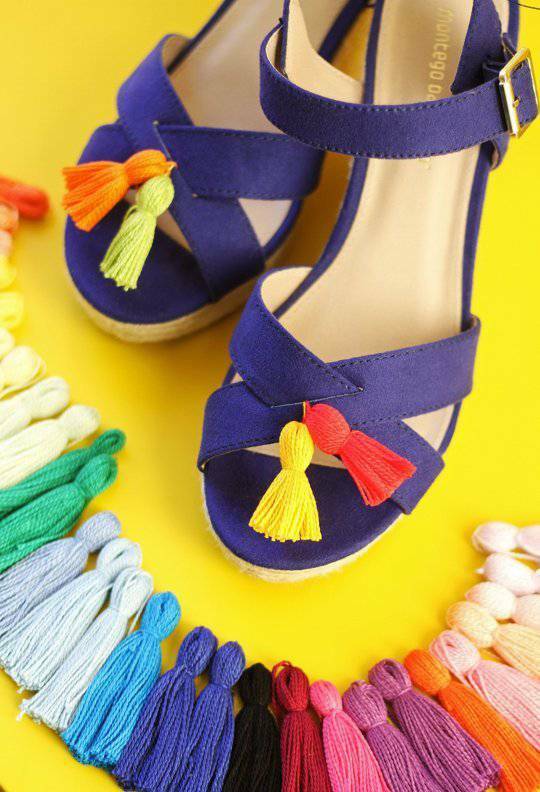 The pompom look is easy to achieve, all you need is a pompom lace of your preferred color and some glue to stick the lace to the straps of your footwear. The look is easy and playful. You can mix and match with two shades of laces or stick to just one solid color. Hope these DIYs help you transform your old footwear with minimum expenditure and nominal effort.